Picture people… that’s what they would call us. Those who had become interested in tattoos. Images representing something within us. Tattoos have come a long way. From indigenous tribes believing their mystical power to docklands of sailors and women of the night. As symbols of rebellion and the socially condemned, to the jail cells of criminals, representing their resistance and pain. Finally arriving at the present day, to become an integral part of fashion and accompanied by exciting stories. Previously, the tattooist was considered a craftsman, but nowadays they themselves are known as artists, with tattoos becoming more improvised and imaginative. They have become an undivided part of body art, and successful in the field of art. Competitions are hosted and tattoo jams take place. 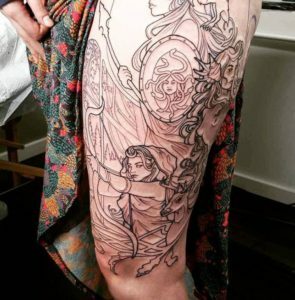 They have become both the subject of entrepreneurs and artists, and one might say, the proud tattoo owner is now almost anybody. As you walk the streets you can come across „live images“ in the open air, inspired by a blend of style and symbolism from classical art, which connect with the new. Works of old masters are themselves, at first glance, easily identifiable and those of Alphonse Mucha are no exception. The Art Nouveau painter, graphic artist and designer, a master in his field, was not called „the greatest decorative artist in the world” in vain. 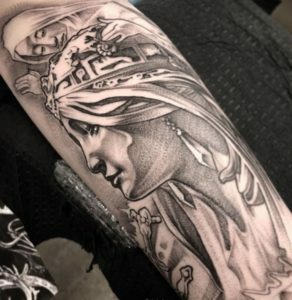 He is one of the few timeless artists who brilliantly combined symbolism with mysticism, ever changing, unique creations in their own right. His work is still unrivalled almost a hundred years later, brought to life through body modification, independently or alongside other works. The most characteristic and most commonly used is the representation of women’s graceful curves that blend with floral motifs. decorative lines and a subtle range of pastel shades. In combination with symbols, ornaments, abstract shapes and the skin of the wearer. 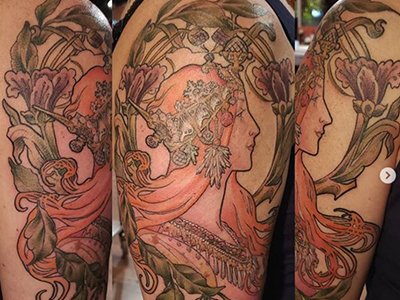 A Mucha provides an impressive and unmistakable tattoo with which you can do almost no wrong. And don’t fear, even over time, when it loses its sparkle and shine, its ability to mature with you, much like a painting, makes it something truly unique. The artists that did these tattoos should be credited!